Hey everybody! I'm hitting the road on my wedding planning trip tonight! I have been packing my suitcase for the past few days, and I've made a list of the items that I think you must have with you when you are going to be doing a bunch of wedding planning things. Coincidentally these are all items that are in my carry on, or that I'll be wearing. A roomy bag- I am using this black leather Ralph Lauren tote that I got at TJ Maxx last year as a carry on. I usually use it as my work bag, because it is the perfect size to hold a ton of things. It is super durable (seriously, I am not gentle on my bags), and it really goes with just about everything. It will be great to carry all the things I need with me. Camera- I have gotten tons of love and words of wisdom about my trip, and the number one suggestion was to take lots of pictures! I definitely have to make sure to remember! Dave got me a point and shoot for Christmas a couple years ago, and I have to remember to use it! I usually just use my iphone! Computer- I use my chrome book so freaking much it's not even funny. Whether it is too look at Pinterest for inspiration, or to browse Wedding Paper Divas for which save he dates and invites we want, I'm on it all the time. Phone- This may seem obvious, but smart phones are a necessity! On my phone, I have access to The Knot app, the Etsy app, and a million different coupons. I also now subscribe to emails from a ton of wedding social media accounts. Any question, inspiration image, or anything that you could think of is pretty much all at my fingertips. Planner or calendar- I use a Day Designer as my planner, and I absolutely love it. I have all our vendor appointments written down in the daily schedule section, and a running to do list for the week. I highly recommend this if you are a Type A personality (like me). Wedding Binder- This is something that I haven't been very good at, to tell you the truth. I printed out a free printable to create my binder, bought a binder and some dividers. I put them all together, but haven't really filled anything out, and it is NOT cute. I am bringing it with me so that as I get more information I can add it. Hopefully my sister can help me jazz it up a little. Sunglasses- I can't go anywhere without sunglasses. My mom and I are going to be doing a lot of driving in the next few days between vendor appointments, and cute shades are a must. Jacket- Our venue is outdoor/indoor. It would seriously stink to have my first experience seeing the venue be tainted by cold temps, rain, etc. Comfortable shoes- A day packed with vendor appointments means lots of walking. Cute shoes are important, but so is comfort. I got these flats on sale at Target, and they are my go-to for work, play and everything in between. 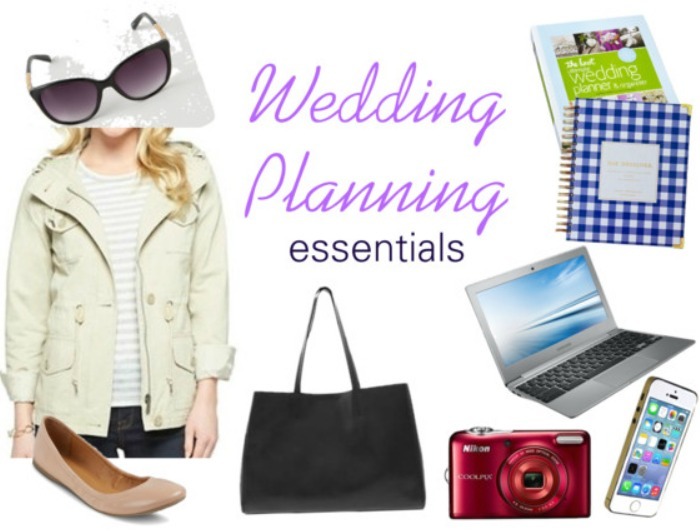 Can you think of any wedding planning essentials to add to this list? Any must haves? Having a big bag as a carry on is the most important thing during wedding planning haha. Dave got me a long champ bag for Christmas and I don't go a day without. Have so much fun on your trip, can't wait to hear about it! Have fun! Comfortable shoes and camera a must! I have a wedding planner bit in constantly making up my own sheets. Have an awesome trip! Hope you check lots of things off your to-do list! Have a great trip!! Definitely take lots of photos!! I was also bad at the wedding binder.. I ended up filling it with contracts and lists and magazine tearouts, so now it's more of a wedding scrapbook. Have so much fun on your trip! I will do this with my vow renewal we had a month tops to plan our wedding. We've already been engaged for almost a year, so we are just now getting in to the swing of things! I just worked on it a little bit on the first leg of my flight, but it still isn't very pretty! :) It's also very empty, so we will see! I will try! Thanks friend! I've printed out a printable, and then pulled some out of a book someone gave me. I think it's important to make it what you need. :) I worked on it a little on the first leg of my flight, but that was really just to put it together. We will see if it really gets filled up! Congrats on your wedding. Fun. This is the best times. It gets crazy, but you'll love it. When is the date? Love it!!! So true as I just got married a little over a year ago and loved my planner! Love this list! I didn't have a wedding planner and TOTALLY regret it! I think a wedding binder is something I felt kind of pressured into but I hardly used it. For me personally i think I would've been better off just keeping everything digital. Yay, I hope you have a blast on your trip! I can't wait to hear how it went when you come back. Thanks!! I'm getting LOTS of stuff crossed off my the list! I've been kind of pressured into keeping a binder as well. While it's nice to keep my documents together, I haven't been using it that much. In terms of a wedding planner (a person) we have a couple of coordinators that come with the catering and the venue. I don't think we can afford an additional person unfortunately but thst would be nice! Do you mean a person? Im not sure if we have the budget to hire a wedding planner, but that would be amazing! Im still working on the whole organizing binder, but having pinterest on my phone yesterday was amazing when I met with the caterer!